Triclabendazole (TCBZ) is the most widely used flukicide because of its activity against immature fluke. Unfortunately, this has led to the development of resistance in several countries and reports of suspected resistance in the UK. Currently there are no validated field-based methods for the detection of fluke resistance and confirmation is extremely difficult. As a consequence, reported cases of TCBZ-resistance in the UK are very much anecdotal. An EU-funded project DELIVER has evaluated an FECRT for fluke resistance investigations and several other in vitro and immunological methods have been investigated and reported but have yet to be validated for field use. Where resistance appears or is suspected, the first sign is usually a failure to kill the youngest immatures, with subsequent re-appearance of fluke eggs in the faeces earlier than would be expected if the drug retained full efficacy. As resistance develops, eventually adult fluke are able to survive treatment as well. The possibility of other reasons for flukicide failure should always be considered, particularly if animals are in poor condition or may be suffering from liver damage. Pastures with very heavy infestations can mean farmers are caught out by the speed which animals become re-infected following treatment. TCBZ is widely used because it kills early immature fluke and historically has been highly effective when used correctly. It does, however, have to be partly metabolised by the liver before it can work properly. If the liver is already damaged through a high fluke burden or other concurrent disease this has the potential to reduce efficacy. Inaccurate dosing through underdosing and/or badly calibrated and maintained equipment is often the root cause of an apparent failure. Incorrect product choice, for example the use of an adulticide in the autumn leaving large numbers of immature flukes untouched to continue to cause disease. Rotational use of TCBZ, closantel or nitroxynil should be considered where flukicides are used strategically, although additional treatments may be required in years when TCBZ is not used. Opportunities to avoid the use of TCBZ should be exploited whenever alternate drugs will give satisfactory levels of control. For example, the use of closantel or nitroxynil three-weeks post-housing, and/or treatment of chronic infections in the spring with an adulticide. Fluke Egg Count Reduction Test: Collect 10 individually identified faecal samples before treating animals with a flukicide. Treat using best dosing practice and, three weeks post-treatment, collect individually identified faecal samples from the same 10 animals. A validated test has also been described using pools of 10 x 5g faeces and counting all eggs present in the 50g sample both pre and post treatment. 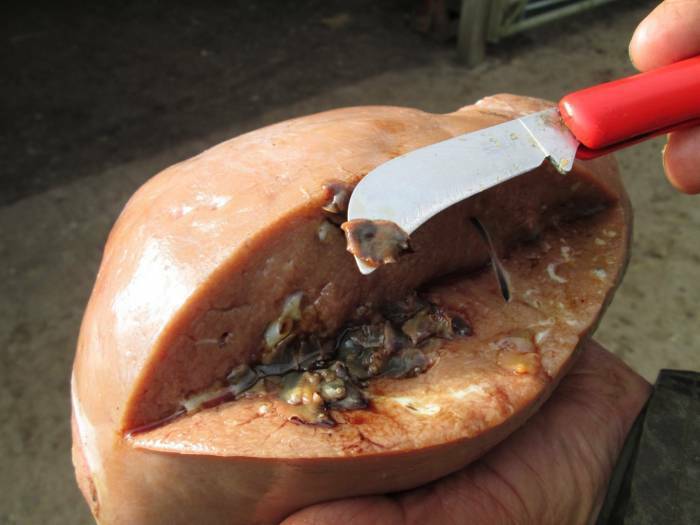 The FECRT can only be used when adult liver fluke are present in the liver and eggs must always be counted. At times of year when immature flukes are also likely to be present it is most useful following treatment with triclabendazole or closantel. It has been suggested that following successful treatment, egg numbers should fall by at least 90-95%. Coproantigen Reduction Test: Collect 10 individually identified faecal samples before treating animals with a flukicide. Treat using best dosing practice and, two weeks post-treatment, collect individually identified faecal samples from the same 10 animals. This test can be used to assess triclabendazole efficacy at times of year when the liver fluke burden is likely to consist of late immature/adult flukes. If treatment has been successful, the mean percentage positivity should ideally fall by at least 90%. For other flukicides the test can be used when liver fluke burdens are expected to consist of adult flukes. Any reduction in positivity should be interpreted alongside the expected efficacy of the product against adult liver fluke, as noted in the data sheet. Please note there are no WAAVP guidelines for the detection of flukicide resistance. Histopathology: Microscopic changes to the liver fluke skin, reproductive and digestive tract can be used as a guide to whether the fluke are resistant to either triclabendazole or closantel. The test requires the recovery of live liver flukes two to three days after treatment, which has both practical and ethical contraints. Egg Hatch Assay: Under development with varying success. Treatment failure for liver fluke is not always down to tricladendazole resistance; consider other factors that may be involved.